SFA School of Theatre to present Pulitzer Prize-winning "Sweat"
The SFA School of Theatre will present Lynn Nottage's "Sweat" in what will be the play's Texas premiere. The show is at 7:30 p.m. Tuesday through Saturday, Oct. 2 through 6, in W.M. Turner Auditorium on the SFA campus. NACOGDOCHES, Texas - A play that speaks to working class Americans with real-life issues opens the Stephen F. Austin State University School of Theatre's Mainstage Series this fall. Lynn Nottage's "Sweat" won the 2017 Pulitzer Prize for Drama. The play opens at 7:30 p.m. Tuesday, Oct. 2, for a five-night run at SFA in what will be the play's Texas premiere. Using a backdrop of industry job cuts, downsizing and poverty, "Sweat" gives working class people a voice, according to Cleo House Jr., director of the SFA School of Theatre and of the play. "We selected this play because it speaks to real issues and real people," House said. "It speaks to working class people of all races. "The play is also highly entertaining and funny, all while tackling some serious economic issues for the average working class American," he added. "Sweat" is the story of a group of friends who have spent their lives sharing drinks, secrets and laughs while working together on a factory floor. "But when layoffs, promotions and picket lines begin to chip away at their trust, the friends find themselves pitted against each other in a heart-wrenching fight to stay afloat," House said. Veteran entertainment journalist Jeremy Girard called the play "ferociously engrossing" stating, "no play in recent memory has shed more light on the crises and tribulations of America's great retrenched working middle class." Nottage is an American playwright whose work often deals with the lives of marginalized people. She is a professor of playwriting at Columbia University. SFA School of Theatre presented her play "Intimate Apparel" in 2017. Her play "Ruined" won the 2009 Pulitzer Prize for Drama. Because of its themes, "Sweat" is recommended for age 13 and up. House also recommends the play to anyone who is curious about people and their reactions to adversity. "The play really does look into how we as a community respond to an inevitable change that threatens our dreams and our plans," he said. The play bounces back and forth in the time periods in which it takes place - from 2000 to 2008. "To be able to clearly communicate time and place without making it about time and place is a delicate balance," House said. Student actors will be challenged to portray characters who are older than them and who have more life experiences, House said. "There's a certain sense of being grounded that comes with age," he said. "Getting young actors to find that takes time." House hopes audiences will be both entertained and engaged with "Sweat." "I hope they leave with a conversation on their lips," he said. "I hope that they ask themselves, 'What would I do?' if they found themselves in these characters' positions." 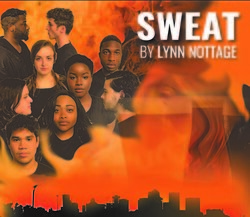 "Sweat" will be presented at 7:30 p.m. Tuesday through Saturday, Oct. 2 through 6, in W.M. Turner Auditorium in the Griffith Fine Arts Building, 2222 Alumni Drive, on the SFA campus.